Finally, I am getting around to taking on another cabinet painting job in our home, the Butler’s Pantry. Historically, a butler’s pantry, sometimes referred to as a scullery, is a dedicated space in a home used to store the family’s silver, numerous sets of china, and large serving dishes and platters. The space was also used to count and polish the silver; in order to protect these heirlooms from theft, a butler would keep the pantry under lock and key and some butlers even slept in their pantry. Today, butler’s pantries are located just off the kitchen or dining room and are used as staging areas for serving meals, as well as a space for storage. In a butler’s pantry you’ll commonly find a countertop and cabinets for keeping serving pieces, tableware, wine glasses, table linens, candles, and other items for the dining room. Upgrades on the space can include a dishwasher, small refrigerator, or sink. Our Butler’s pantry is located just off the kitchen and connects to the dining room. We use it mainly for storage of our fine crystal and extra china. 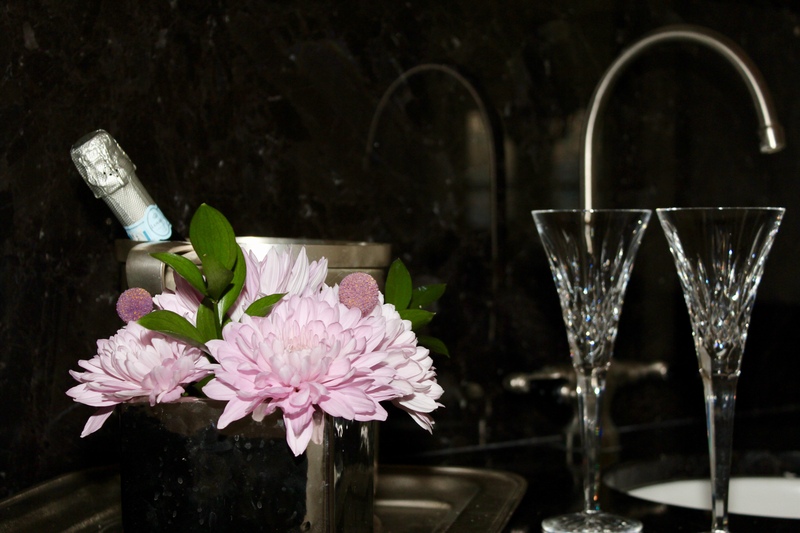 When we entertain, the space can be used to set up a serving bar for cocktails with ice bucket, glassware and drinks. I dislike the appearance of the room so much, I try to use it as little as possible. This space is in dire need of a makeover. Let’s take a look at the before pictures of the space. These cabinets may look familiar to you, they are similar to our kitchen cabinets before we painted them during the kitchen renovation HERE. The cabinets have a grayish hue and appear dingy. And these knobs have to go, being replaced with stylish pulls. We will fix the cabinet door that is hanging down and doesn’t close properly (been driving me crazy for a year)! The room will also be painted a lighter color to brighten up the space. I will paint all the cabinets in white and add under, over, and in-cabinet lighting. And the “rain textured” glass will be replaced by clear glass for a modern look. Using the best primer and paint available on the market is essential to having your space look professionally painted. I used this primer HERE and 2 coats of paint HERE to cover the cabinets. I highly recommend using Benjamin Moore, I have painted many cabinets and doors in the past and this paint does not disappoint and is holding up very well in our other spaces. I could never do this job without my favorite angled brush HERE, it allows me to get into all the nooks and crannies with ease and the short rubber handle is perfect for my grip. I used a brush to complete most of this job, using a roller very sparingly. We added all pulls in a modern french country style – similar HERE and fixed the cabinet doors by replacing the 3 hinges on the inside of the door. For consistency purposes, the middle “drawer” which doesn’t actually open since it is located directly under the sink, got a new pull as well. In case you’re wondering, I did not remove the items from the upper and lower cabinets, nor did I remove the doors before painting. We left the marble countertop and backsplash in tact, just gave it a good cleaning with my favorite glass cleaner HERE. For inside cabinet lighting, we added these pucks HERE, they are easy to install and provide ample lighting. We also painted the room in the color “ASH” by Restoration Hardware, and used Benjamin Moore paint. The under cabinet lighting HERE was easy to install and looks beautiful. The clear glass allows our crystal to shine through and gives a much cleaner, brighter and modern appearance. This was an inexpensive renovation which completely transformed the space, and was totally worth the effort. It ties in perfectly now with our kitchen and we can use the space for entertaining. It would really pop if you added some wallpaper to the back of the glass uppers and painted the sides and the shelves to match the cabinets. I thought about painting the inside, but I really like the white and light wood contrast. Good suggestion about the wallpaper! Once again I love it..
Love it, I’ve become a fan of your blog! Thank you! I appreciate you saying that…blogging is hard work for sure but I really enjoy it.